There’s a very good chance that one of your favorite fishing spots plays host to aquatic plants. They are a magnet in most fisheries for both predator and forage species alike. Depending on the plant type, they can provide shade, security, ambush sites, and/or food. We’re going to break down a few of the submerged plants that seem to always play a big role in finding quality bass. Studying this information will help you identify the different vegetation species, how they grow and help you catch more fish. 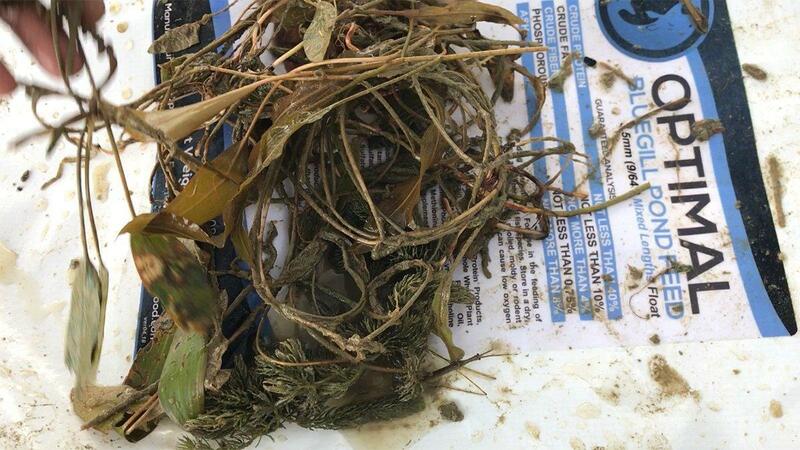 Coontail is a rootless, submerged plant found growing in extremely dense colonies or as floating mats. It has multiple branching soft stems that can be 10 feet in length. Leaves grow in a whorl pattern and individual leaves are slender, short and stiff. The leaves fold forward at the terminal end of the stem resembling a fox or raccoon tail. This plant can reproduce through seeds and fragmentation. Coontail can be found across all of North America in water 1 to 20 feet in depth or floating as a mat. Fish will utilize the canopy of mats for shade, the edges of the coontail growth provide ambush cover and the internal parts of the plant colonies provide juvenile and forage fish ample protection. Go-to presentations:Target the visible gaps with Texas-rigged creature baits or jigs. If the water is stained and your visibility is hindered, blind casting with the two aforementioned baits will continue to produce bites. When you feel a bare spot in the middle of the coontail, expect a bite! There are several pondweed species found throughout North America. Most of the pondweed species will have flaccid, submerged stems with non-flaccid emerged parts and floating leaves. Both submerged and floating leaves will resemble traditional leaves with an oval or elongated shape and a glossy appearance. Stems extending out of the water column may contain small fruit commonly consumed by waterfowl. Pondweeds are typically located in shallower water in fairly dense growth patterns. Floating leaves form a thin canopy easily punched and fish use both the edge and internal parts around stems. Go-to presentations:Topwater presentations and weightless plastics can be a great way to cover water quickly. It can be stringy, so it’s a bit more cumbersome to rip fast-moving lures through pondweeds. There are several species of water milfoil found throughout North America. 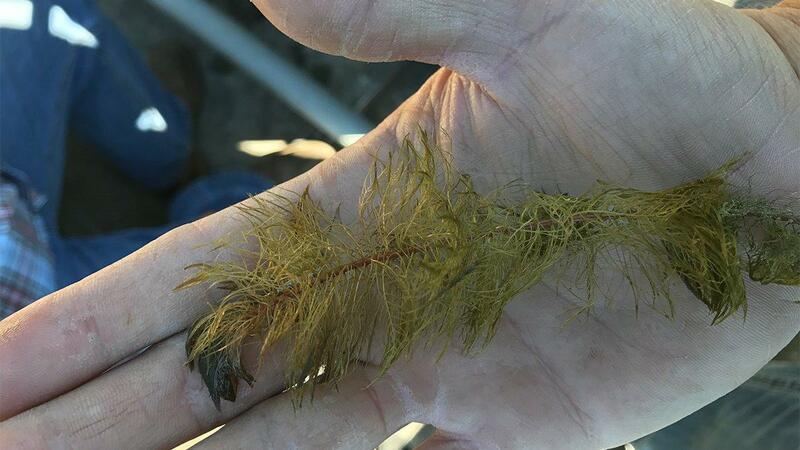 In general, milfoil will have soft, submerged stems and feather-like leaves. The leaves will have leaflets that make up the feather-like appearance; one of the best ways to identify the various species is through leaflet counts. Leaves grow in a whorl pattern typically of 4 leaves per node. Milfoil can reproduce through fragmentation, seeds and rhizomes. 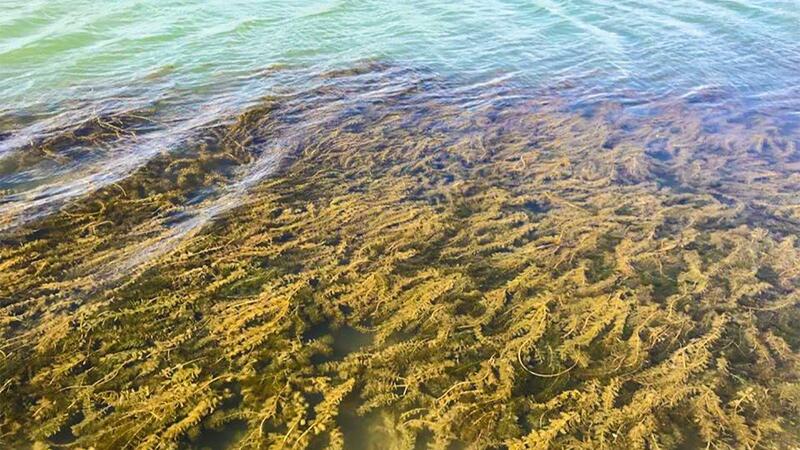 Milfoil forms dense, woven colonies in 1 to 20 feet of water with heavy surface mats typically in clear water. Juvenile fish will utilize the dense internal cover, while predators use the edges to ambush prey and the dense mat for shade. 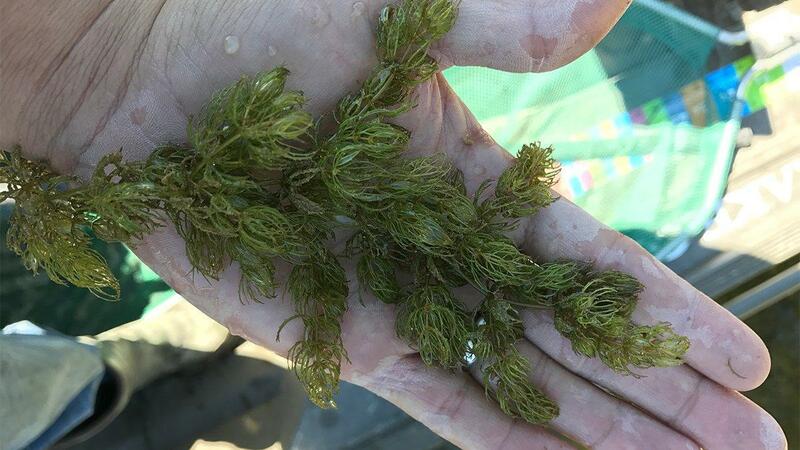 Go-to presentations:You can fish milfoil very similarly to how you’d fish hydrilla. Ripping reaction lures through it will draw bone-jarring strikes from nearby bass lurking in the shadows. Hydrilla is a rooted, submerged plant with multiple branching stems. Hydrilla leaves will be blade-shaped and fairly thin and short. The underside of the leaves will have small teeth that feel rough when rubbed. The leaves grow in whorl pattern of 4 to 8 and in segments that are spaced further apart at deeper depths. Hydrilla can reproduce through fragmentation, seeds, turions and rhizomes. It can be found rooted in water 1 to 20 feet in depth as large colonies which form surface mats at times. The distribution of hydrilla is mainly along the southeastern states, Texas, California and the east coast. Hydrilla has a native family member called Elodea (elodea canadensis) which does not have the teeth on the underside of the leaves. 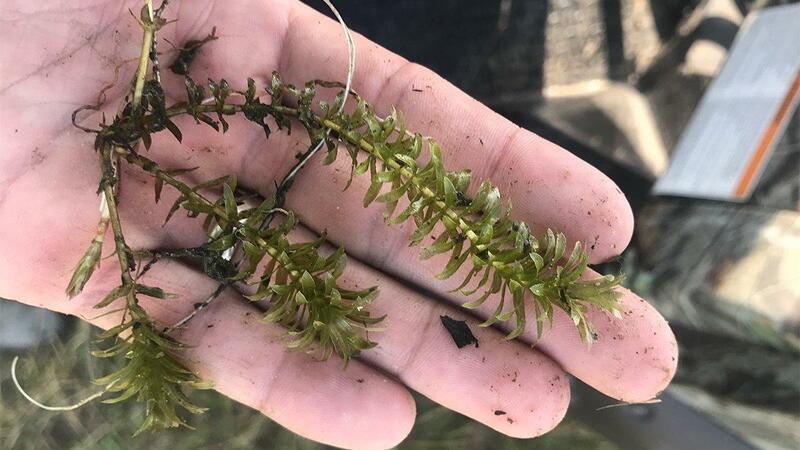 Fish utilize the outer edges and the top of hydrilla colonies as ambush sites, while juvenile and forage species will utilize the dense mats to escape predation. Go-to presentations:Rip lipless crankbaits, squarebills and bladed swim jigs through the tops of hydrilla and hang on! The bass will often attack your bait as it snags free. Eelgrass can be found throughout North America. It has thin, ribbon or tape-like leaves that can reach 3 to 4 feet in length. Leaves have rounded tips, a mid vein and grow in clusters from the root. Eelgrass grows in extremely dense colonies or islands, typically in water with some type of current or flow. 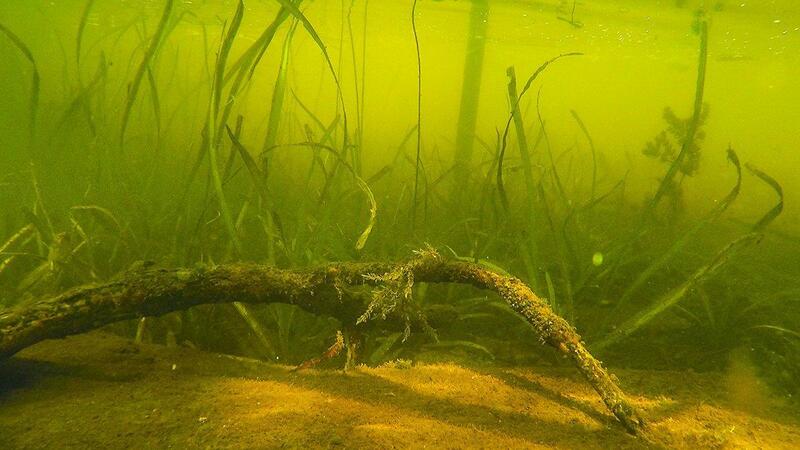 Eelgrass reproduces mainly through rhizome or a banana-like capsule that contains seeds. Go-to presentations:In the fall when the eelgrass is especially thick, punch through it with a 1 or 1 1/2-ounce Texas-rigged creature bait. When the eelgrass is sparse in other times of year, a bladed swim jig and weightless soft plastics can elicit some aggressive reaction strikes. Check out this great video shot by Steven Bardin. You can find more information on his popular and highly interactive Facebook page.